The battle against Fahai rages on. During the fight, Wonder-Woman is cut in half, revealing that she is really a large green snake. Super-Man Zero unleashes his solar flare power and the fight ends. The JLC are tasked with finding the now depowered Super-Man Zero. Kenan locates him, but allows him to go free after taking pity on him and his lack of true identity. Meanwhile, back at the Ministry's headquarters, Deilan is under medical examination. Now completely in the form of a snake, Deilan's past is revealed. Long ago, a white snake fell in love with a boy and decided to try to become human. The white snake enlisted the help of a green snake to focus their qi in order to transform themselves into humans. A turtle named Fahai laughed at their attempts, but one day, the two snakes proved successful. The white snake found the boy who had since become a man, but the green snake was disheartened as she too had fallen in love with the boy. One day, a sorcerer monk attacked white snake and green snake. It was Fahai, who had also cultivated his qi. Pushing aside her jealousy, green snake defended her friend and pushed Fahai over a cliff. Unfortunately, Fahai placed a curse on green snake, imprisoning her in stone. Many years later, Dr. Omen found the statue and freed green snake, giving her the name Peng Deilan. Bat-Man shows Kenan video evidence of his father's survival while elsewhere, Super-Man Zero is recharged by I-Ching and persuaded towards the side of evil. Now determined to rid the planet of superheroes, Super-Man Zero dons a new suit and takes up the name Emperor Super-Man. Kenan confronts Dr. Omen about the survival of his father, but before any real answers are given, they are attacked by Emperor Super-Man. As the issue ends, Kenan learns Dr. Omen is his mother. Story - 5: Wow! There's a lot going on in this issue, but I think Yang manages to fit it all in without anything being glossed over or barely addressed. 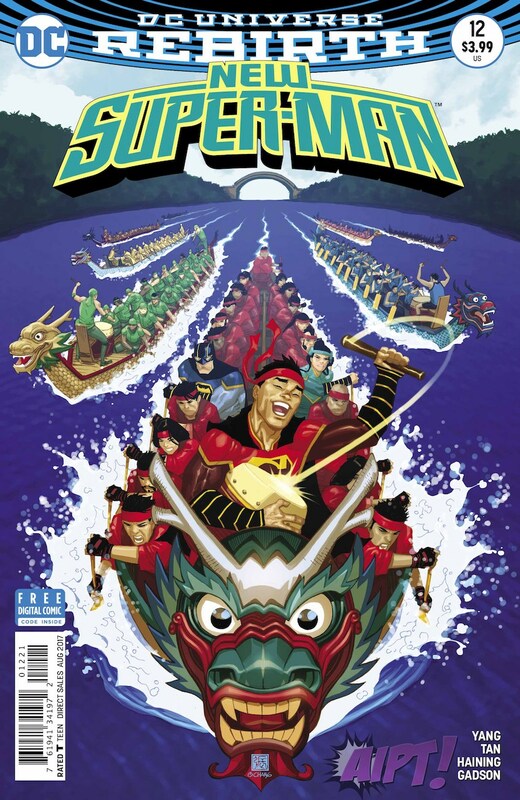 I might have mentioned this in a previous review, but I love how he brings Chinese culture and folklore into this title. I think the strength of this title, outside of the characters and plot, is that Yang makes everything feel authentic because he draws from what he knows. Speaking more to the plot, I am genuinely interested in knowing where this story goes. Why has Dr. Omen been keeping her true identity a secret? How did Kenan's father survive? What do the revelations regarding Deilan's past mean for the JLC? My only gripe is that this is a monthly book. Art - 4: Billy Tan brings some top-notch work to this issue. While the action set pieces are fantastic to look at, I think the real strength of this issue lies in the sequence where Deilan's backstory is revealed. There's just something about it that screams ancient China and grabs your attention. The splash pages are also fantastic, especially the page where Super-Man Zero uses his solar flare. Every now and then, a face will look a bit funny. Otherwise, Tan is knocking it out of the park on this book and proving himself to be worth of replacing Bogdanovic. Cover Art - 3: I'm conflicted regarding this cover. 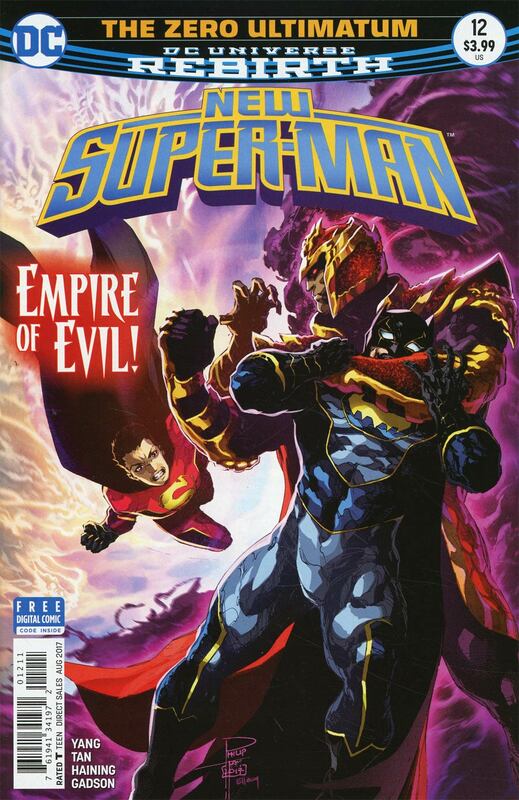 On the one hand, the art is solid and Emperor Super-Man looks to be a challenging foe. On the other hand, I would have liked to have seen something involving the white snake/green snake story. I think that would have made a gorgeous cover, especially if made to look like water colors. Not bad, but definitely a missed opportunity. Variant Cover Art - 2: I don't care for this cover very much. I get that variant covers aren't bound by comic book law to be a representation of the story within, but something different would have been nice. Much like I said regarding the standard cover, I would have liked to have seen the green snake/white snake thing on the cover. The variant cover was the opportunity to do that. The art is fine, though I'm starting to dislike the way Bernard Chang draws Kenan. That isn't to say that Chang is a poor artist. I'm just tired of seeing the same goofy expression on Kenan's face each month.